Definition: The Test marketing is a tool used by the companies to check the viability of their new product or a marketing campaign before it is being launched in the market on a large scale. The market test is generally carried out to ascertain the probable market success in terms of new product’s performance, the level of acceptance of the product, customer satisfaction, and the efficiency of the marketing campaign. Through test marketing, a marketer may ascertain the success ratio of the new product and the marketing campaign and can design the marketing mix ( viz. Product, price, place, promotion) very well before its launch. The test marketing of the consumer goods and the industrial goods vary, let’s discuss it one by one. Trial: Whether a consumer will try a product, at least once. Repeat: Whether the consumer will repurchase it after the trial. Adoption: Whether the consumer accepts the product and will purchase it again. Purchase Frequency: How often the consumer will buy the product. 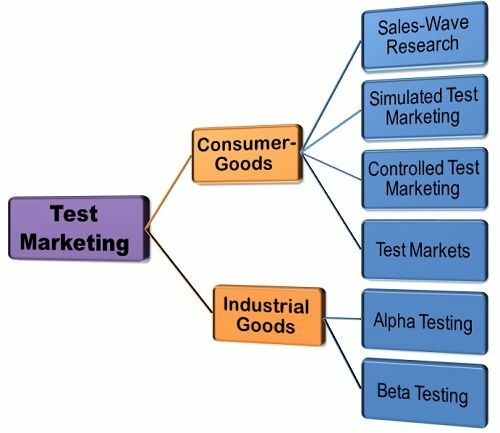 Sales-Wave Research: Under this test, the consumer is offered the product, again and again, free of cost. This is done to determine the willingness of the customers to use the product every time it is offered. Simulated Test Marketing: Under this test, 30-40 customers are selected and are invited to the store where they can buy anything. The new products are placed with the old or competitor’s product and then consumer’s preference is ascertained through their selection of the products. In case, the new product is not chosen by them, then the free samples are given to the customers and are inquired telephonically about their product experience after some weeks. Controlled Test Marketing: Under this test, the company select certain stores in different geographic areas and ask them to keep its new product into their stores in return for a fee. The company controls the shelf position, displays, point of purchase promotions and pricing. Test Markets: Under this, the firm chooses the representative cities where the full-fledged launch of the new product is done starting from the promotion campaign to the ultimate sales. Once it is successful, the firm goes for the national launch. Alpha Testing: The alpha testing is done within the firm by test engineers or employees who check the marketing mix of a new product and fix the issues arising in any steps of launch. Beta Testing: The Beta Testing is done with the customers where they are asked to use the product and give their feedback on its usage.The other way to test the business goods is to introduce it to the trade shows and observe the reaction of customers to it. Also, these goods can be tested at distributors and dealers showrooms the attention of the customers can be gained. Good article on test marketing. Some more insights on when alpha and beta tests are preferred would have been more helpful.